By Peter Sellick - posted Friday, 4 October 2013 Sign Up for free e-mail updates! The idea of consolation seems out of time. It may be that we in late modernity are so preoccupied with the triumphant human spirit that we no longer need to be consoled. To admit the need is to admit weakness and hence shame in a culture that is optimistic and victorious. We have become our own consolation as the queues for the new iPhone bear witness. The secular critique of religion has determined consolation to be a milk-sop for the immature and afraid. The modern self is its own consolation. It finds the meaning of its life in the choices it makes and the life that it consciously plans and builds. Much of the piety of the eternal rewards have worn away and seem today like so much crowd control. But I am sure that the gospel is a great consolation; that the cross of Christ is the pivotal event in history from which flows, if not the immediate defeat of evil and death, for those who live in the time between the times, the promise that evil will not finally win. A proper New Testament eschatology has replaced, in the mind of most theologians, and an increasing number of churchgoers, the individual hope of a glorious life after death. Having said this there is more to consider. How does the gospel come to men and women in the power of the Spirit? The church has acknowledged different paths; the creeds are propositions of orthodoxy, worship is the celebration of the presence of God in Word and Sacrament, private prayer and meditation integrate the gospel into life. Schisms of the church have formed around each of these. From about 200BCE, the church has used art to augment the message of the gospel. This has not been a straight path as is born witness to by the iconoclastic controversies of the early church, Savonarola's bonfire of the vanities in the piazza Vecchio in Florence, the destruction of art in England under Cromwell to name but a few. At the centre of these controversies lies the question of the nature of the gospel. If it is simply propositional, language is all the church needs to convey its "message." Certainly the development of doctrine has been important from the earliest age. But the soul of Christian worship is not an argument but a presence and hence a relationship. It is here that art is essential; even in the meanest situations prayer is poetic. The role of art is to evoke presence and it is a presence of beauty. Although the worship of the church can seem to depend heavily on language and literacy, the life changing encounter with God is frequently associated with the art of music, poetry, and oratory, rather than information imparted by words. Some direction in looking at a painting can be helpful, but only to the extent that indicates where to find meaning that cannot be spoken. The true potential of the visual arts is that they offer the possibility of responding to the great issues of faith, without words, a truth that has no explanation. This statement may be illustrated by Bob's own work. The triptych illustrates the descent from the cross, the crucifixion and the resurrection. While the subject matter is familiar to all Christians the power of the work also lies in the paint and the composition that suggests a deeper story. For example, the face of the person behind the body of Christ in the decent looks up to heaven as though questioning. Christ on the cross is surrounded by animals directly out of psalm 22 and we tremble at his vulnerability. The risen Christ points towards the cross as the event in which our salvation was won and the witnesses fall back and hold their hands before them, dazzled by light. 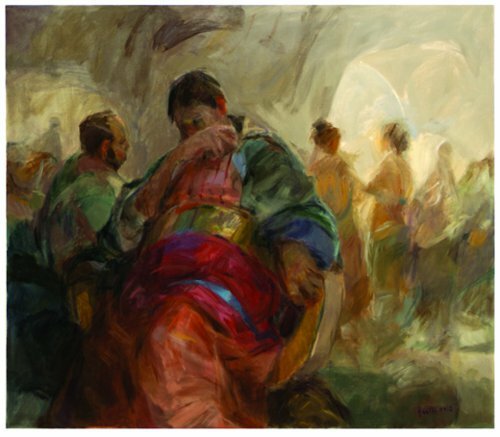 The essence of the Christian story is here but it is not expressed in plain text, the composition and the painting bring a depth of feeling that is unspeakable. The events exist in a landscape under a ragged sky. The texture of the paint and the colour combinations ensure that the eye never tires of looking. The head of the threatening bull is rich and marvellous, the sky above the cross seems to conspire to focus attention. Bob has told the story of salvation but he has also striven for beauty he continually asks "What does the painting need?" We may look at another example of Bob's work, Herod and Salome. Again we need to know the story before we understand the painting. Herod is seated, his back to a male companion and to female figures on the right. He is dressed for a festival but his demeanour is deeply troubled. We know why, of course. In his exuberance for the dancing of Salome he trapped himself into an open promise that resulted in the beheading of John the Baptist. Herod has a lot to regret. It is this moment of regret that is the subject of the painting. This gives us a deeper meaning to the story, Herod is humanised, a gulf opens before him amid the celebrations of the court. There is great consolation here that goes beyond the propositions of faith. Cheap consolation is a mental trick that finds a way of feeling better in the face of loss (He or she has gone to a better place). The platitudes mouthed by civil celebrants at funerals comes to mind. Here, in Bob's paintings we are able to mourn the dead Christ, pity the diminutive figure on the cross and marvel as the light at the centre of the resurrection. We feel with Herod in his self-imposed predicament. The propositions of the faith are more than just illustrated; they come with a punch that would unman us. Is this not the antidote to our triumphalism, the only salve to our grandiosity? Do we not need to be unmanned, to die to our self-obsession? Art breaks through the protective carapace that we habitually grow around ourselves. It does not have to come with a message. Pure music consoles us in ways that we do not understand. For example, there is something in the aria of Bach's Goldberg Variations that breaks through and evokes peace and gratitude. Song in a unknown language can be just a moving as one in our own. It is not surprising that when the words of the liturgy are set to music the gravity of the text comes alive in a surprising way. Painting is like singing the liturgy. We get both the narrative and the emotional expression in one package: the combination is transporting. To be consoled is not to have the pain removed from our lives; we all know that. It is about the discovery of something that is greater than our pain, something that is larger and more beautiful than our circumstances, that takes us over, transports us. We do not have to rely on doctrine alone but are confronted by beauty and meaning in music and paint and our hearts are warmed. The false divide between head and heart is overcome and we experience the faith as one thing. In the face of the violence and madness of the world this thing stands as the ultimate consolation. Modernity knows, at some level, that human existence hovers over an abyss. That is why it is so shrill and self-congratulatory. But the constant discoveries in medical science and technology eventually stale. We need the transcendent, that which words alone cannot convey. Art in the church is indispensable, not an added luxury but an essential companion to the gospel.